"Sometimes, you read a book and it fills you with this weird evangelical zeal, and you become convinced that the shattered world will never be put back together unless and until all humans read the book." Good job taking the words right out of my mouth, Mr. Green. This perfectly describes my journey while reading The Fault in Our Stars. To think that I was hesitant to read it at first because I didn't finish Looking for Alaska as I thought it was too depressing. But this book, "I fell in love the way you fall asleep: slowly, then all at once." I was already almost halfway through the Kindle version I downloaded, but I loved it SO MUCH that I went out and bought a hardbound copy. I took my sweet time reading it, letting all the different emotions wash over me, and even then I found myself clamoring to read it again. Play Details in the Fabric by Jason Mraz featuring James Morrison while reading this, it's perfect. 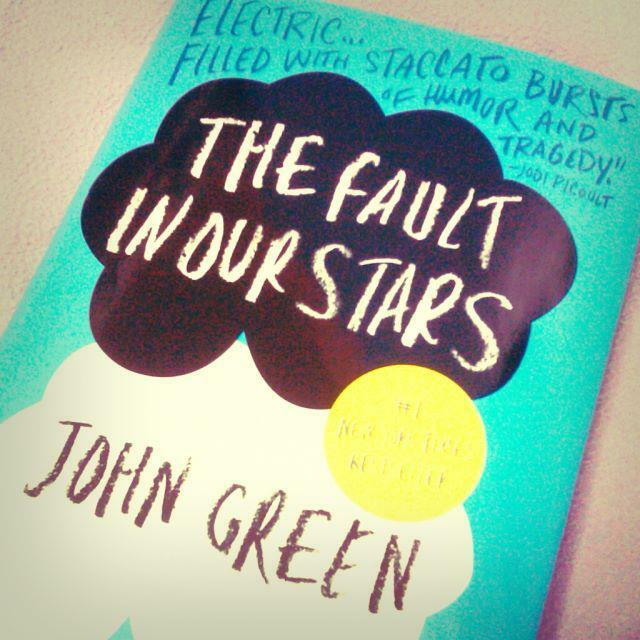 It affected me so deeply and made me feel for Hazel and Gus, not only because I have a friend who is also sick, but because I share some of their sentiments I didn't even realize I had until I read them. They're fictional characters, yes, but there are millions of other kids all around the world who are also afflicted with life-threatening sickness, whose parents live each day in fear that they won't see their precious child again. It's unfair, really, but then again, "The world is not a wish-granting factory." Funny and heartbreaking, The Fault in Our Stars is probably one of the most romantic novels I have ever read. "I'm in love with you, and I'm not in the business of denying myself the simple pleasure of saying true things. I'm in love with you, and I know that love is just a shout into the void, and oblivion is inevitable, and that we're all doomed and that there will come a day when all our labor has been returned to dust, and I know the sun will swallow the only earth we'll ever have, and I am in love with you." Oh Mr. Green, you do have a way with words. To find a love like that... That's the dream. Reading this couldn't have come at a better time. I am actually going through something right now that forces me to evaluate how I treat myself and my relationships with other people. Sometimes I worry that I don't have too many friends, but then I realize I'd rather have a handful of (as my friend Ed said) core friends, instead of feel lonely in a room full of people who are just there when things are going great. Sometimes I get too busy trying to please other people that I forget myself in the process. Sometimes I get too naive and forget how easily some people can take their words back and rip me apart. I refuse to be trampled on though, because "You don't get to choose if you get hurt in this world... but you do have some say in who hurts you." Aside from the declarations of love that never border on being too mushy or too cheesy (although it can leave you wondering about how these teenagers already have a solid view on metaphorical resonances and the universe), what I loved most about the book are the little moments between Gus, Hazel, and their friend Isaac. United not only because of their sickness, they're real friends through and through. We all need "cleanse" days. Whenever the stress and pressure get to me, I find that a good, long cry is all I need to detox and clear my head. Times like this, I only reach for either my copy or DVD of The Notebook. It has never failed me, but now I think I found my new companion for these "cleanse" days. "Okay? Okay." I can't wait. "I'm on a rollercoaster that only goes up, my friend." PS: The italicized text in quotation marks were all lifted from The Fault in Our Stars by John Green.